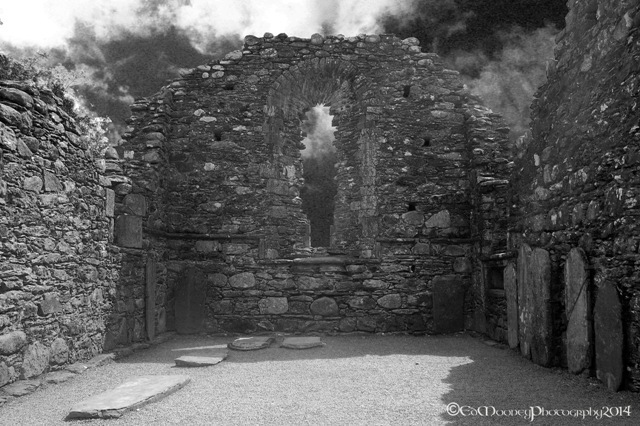 The next big ruin we come to, which is the largest and most imposing building at Glendalough apart from the Round Tower is the Cathedral of St. Peter and St. Paul. 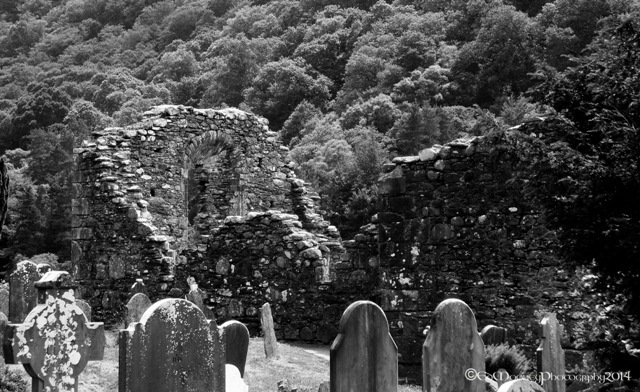 Situated in the south-eastern part of the Monastic City, overlooking the merging of the Glendasan and Glenealo rivers. As the name suggests it was dedicated to St. Peter and St. Paul. 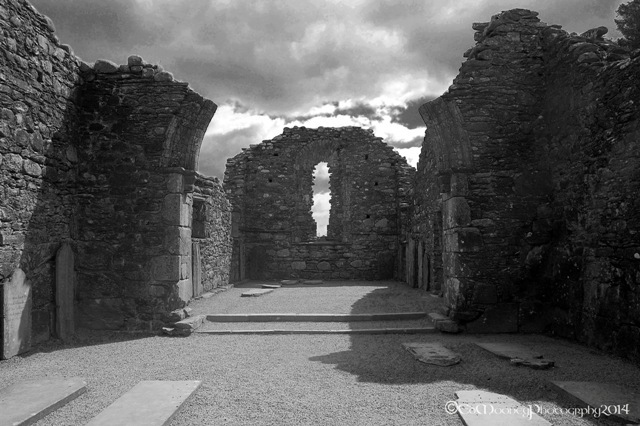 It ceased to function as a cathedral after the diocese of Glendalough was merged with that of Dublin in 1214AD.It was said to have been built in several phases between the 10th and the early 13th century. Consisting of a multi period Nave and Chancel Church with an additional Sacristy to the south. 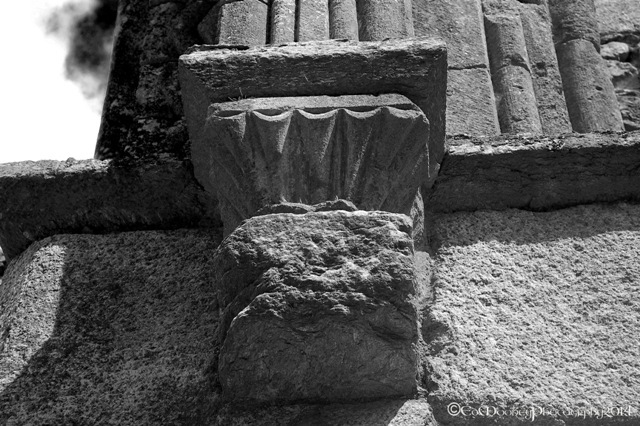 Looking closely you can see evidence of the earlier building which used Cyclopean masonry in the walls of the Nave. By the 10th century there was need for some rebuilding and then it was not until the end of the 12th century that the Chancel was eventually added. Again some reconstruction was necessary in the 1870’s, I presume to make the structure safe and save it from collapse. 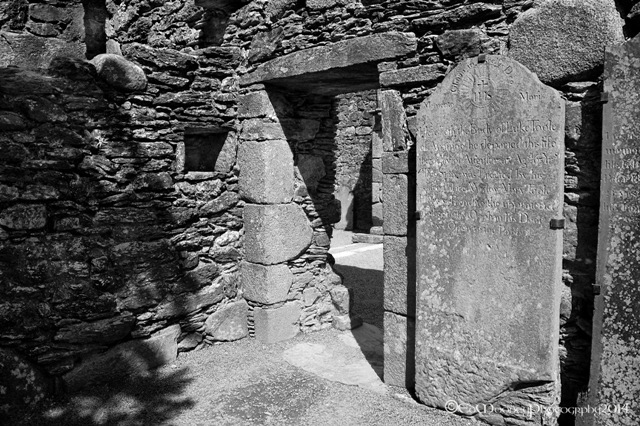 Large mica schist stones, which form the foundation up to the height of the west doorway, were re-used from an earlier smaller church. Whilst the early parts of the Nave were built using Limestone, the remainder of the Cathedral was built using mica schist with some Dundry stone being used to complete the decorative features of the Cathedral. 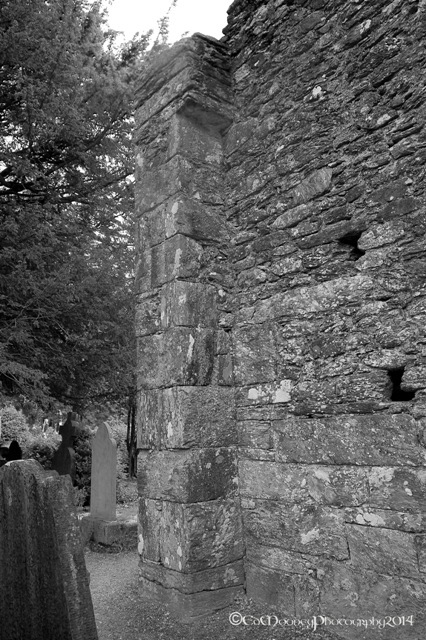 Much of the stonework is said to have been re-used from an earlier smaller church. The Nave which is approx 15m x 9m has antae to the east and west, which would have been used to support the wooden roof. The west door has inclined jambs with flat architraves and a round relief arch above the lintel. 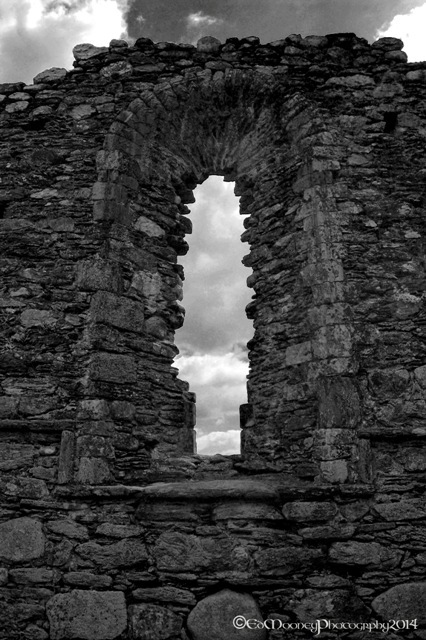 With two windows in the south wall a door to the north. Strangely enough the chancel does not quite line up with the Nave, I guess the architect must have got his calculations wrong for this build. 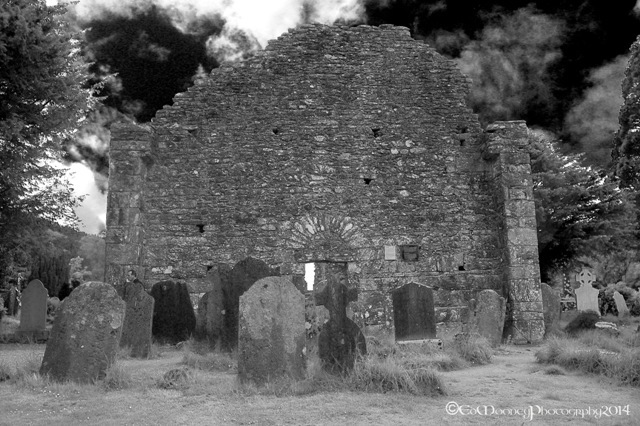 The chancel, sacristy, and north door were added in the late 12th and early 13th centuries , with the chancel arch and east window said to have been once highly decorated, but many of the stones are now missing. That said you can still make out the chevrons on the remains of the Chancel arch which was made from granite. The chancel contains two widows in the north wall and one in the south with a piscina and aumbry, ( a medieval shallow basin and cabinet) below. 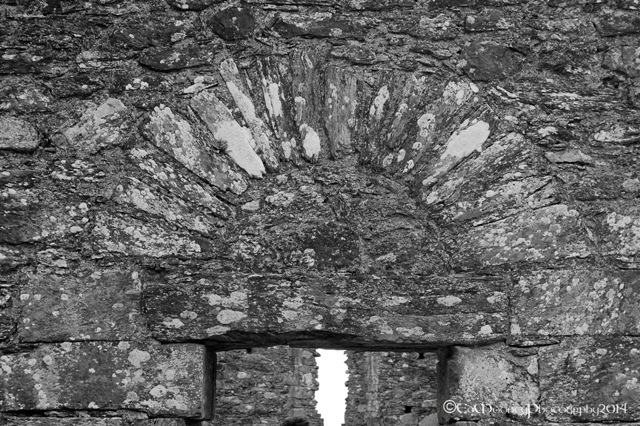 In the east gable there is a tall decorated round arched window .A small door in the south wall of the chancel leads to the sacristy. There are five cross-slabs which lean against the inner north wall of the chancel, three of these are illustrated. One bears two inscriptions ‘Or Do Maccois’, and Or Do Diarmuit’, I wonder might this be in reference to that former treacherous King of Leinster Diarmuit Mac Murchada? 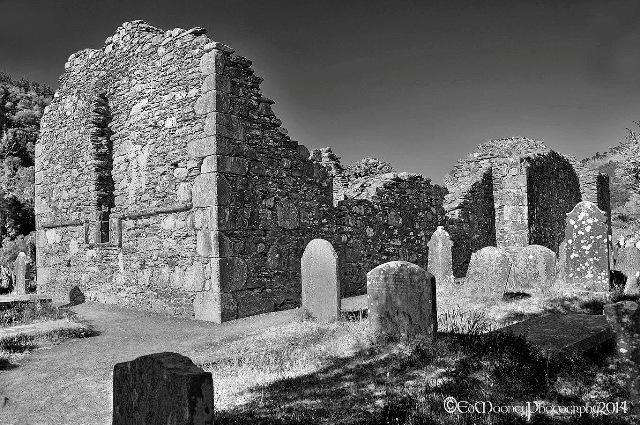 Diarmuid was connected with some other fine religious sites located at Baltinglass Abbey and Killeshin Romasesque Church. 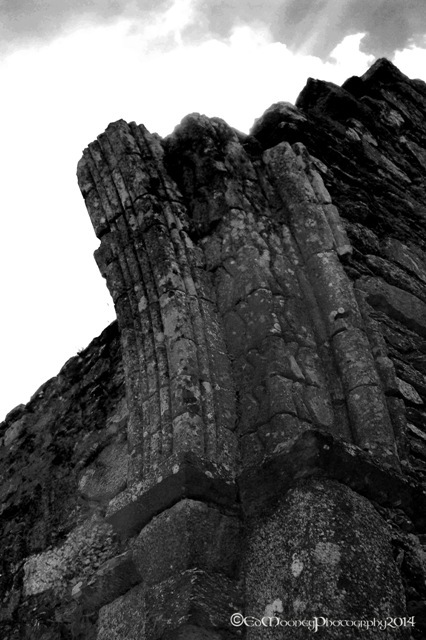 He Capitol was in nearby Ferns, Co. Wexford. 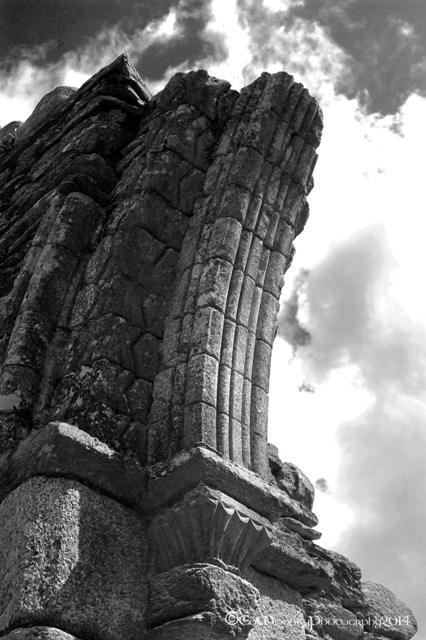 The second Cross Slab reads, ‘Or Do Muirchertach U Chatalan Ocus Do Gutnodar’, Muirchertach Ua Cathalan was a notable person slain at the battle of Moin-mor in 1151AD. There are some 76 undecorated slabs as well as several crosses, cross-slabs and cross-bases around the cathedral. 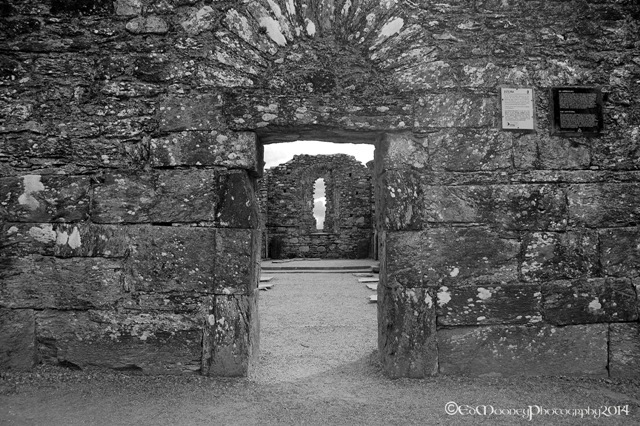 Inside the west door there is what appears to be either a Font or tub shaped cross base. 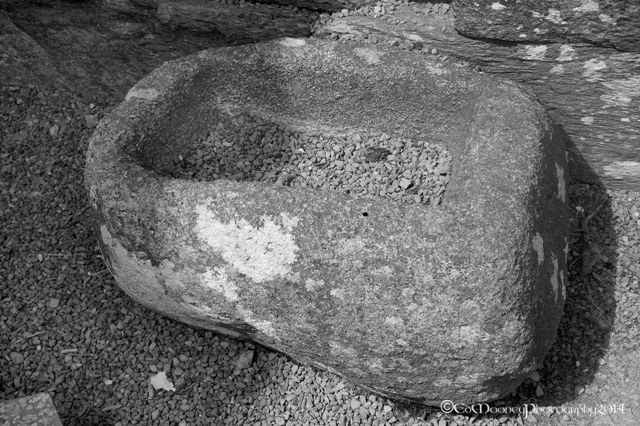 There is no draining hole, and no dowel hole to secure a cover’ so his artefact might also have been a water stoup for the cathedral. 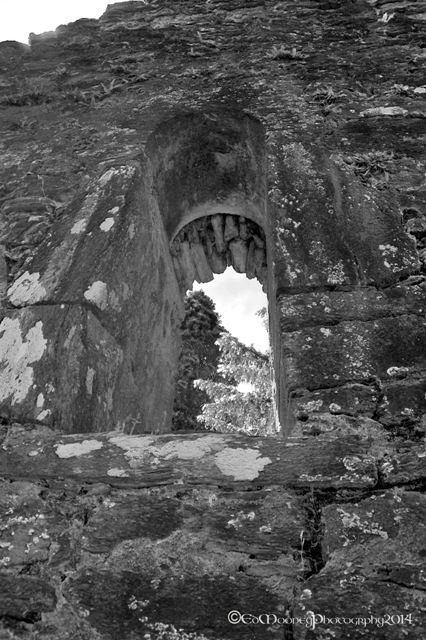 There is what looks to be a Bullaun stone incorporated into the internal face of the N wall of the chancel. Though in ruins, the Cathedral is still an impressive sight with some rather interesting architecture including the remains of a Romanesque Chancel Arch. 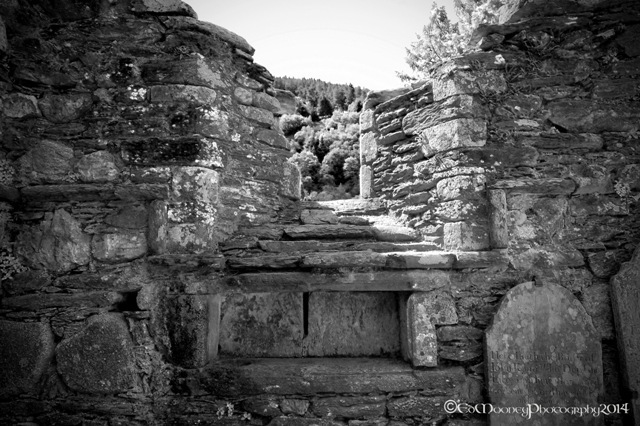 To finish off this part of my explorations in Glendalough, I will leave you with a rather interesting folk tale told to me by an elderly gent I met whilst walking through the woods looking for another church ruin just outside the Monastic City. 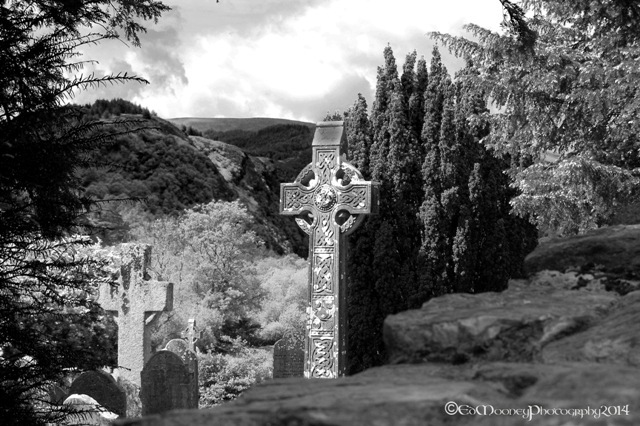 It has long been said that the Lark never sings above the dark waters of Glendalough. The reason for this goes back in time to the building of the monastery. The labourers and masons worked very long hours after agreeing to ‘’rise with the Lark and lie with the lambs’’. These long hours soon had the workers exhausted. Kevin found that for some reason the Larks at Glendalough started their day extremely early. 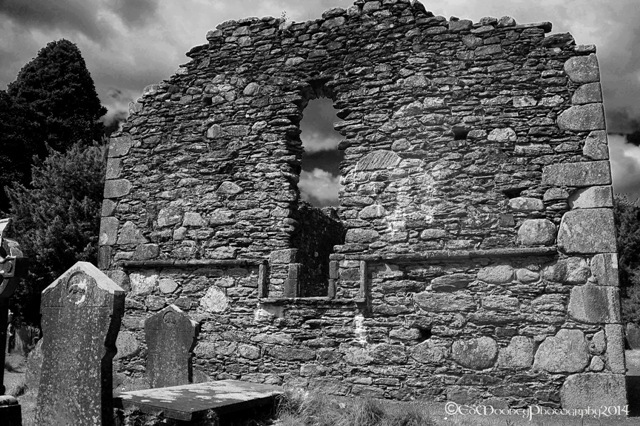 After praying for an answer to the problem, the Lark never sang again in the Glendalough Valley. Chances are that this is merely a tale that came together over the centuries, as Kevin would have died long before much of the city was being built, but I still think that it is a nice story to tell. Thanks to the gent whose name I have forgotten, for sharing it with me. 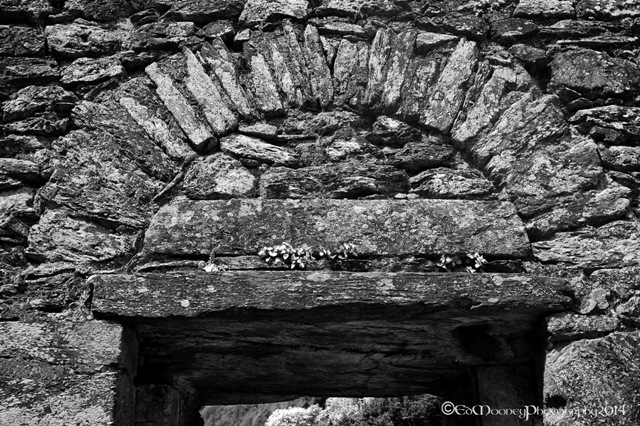 This entry was posted in Diary of a Ruinhunter, Medieval, Photography, Religious Sites and tagged Cathedral of St Peter and St Paul, Glendalough, Ireland, monastery, Nikon, photographer, Photography, ruins, Travel, Wicklow. Bookmark the permalink. You do not know how lucky you are to have that historical reflection at your feet. I especially like the way you captured the arching support for the lintels – great way to end this visit with the folk tale – always interesting. Wonderful photos – great architecture! What are the chances of meeting someone like that there to tell you that story? We are in danger of losing so many local stories like this, which is a terrible shame. You were meant to be there that day, to hear that story and share it with us, and keep it alive. Lovely… and the photography is spectacular, as always! That’s pushing it a bit… but you never know, worth a try, lol! Beautiful photos and good words as always. Other worldly…gives me the shivers. Love it. An excellent series of photos Edward 🙂 your narrative is very interesting too; Then to finish of with a folk tale really polished it off to perfection … Brilliant!!! !